What's going on with CARJACKED's book cover? To make a long story short, the cover jacket was hijacked. Let's take a closer look at the book cover or, as semioticians would say, as the syntagmatic aspects of the text. The main image depitcs a section of an automobile tire print in white color on a black background. The tire print, by the way, extends to the back cover, where other visual elements, including the book title and subtitle, are reversed. As an aside, we experimented with a variety of different tire prints designs before making our final choice. Below is an early example, which we eventually dropped because we felt that the tire looked too much like the spine of a dinosaur. Or a fishbone. 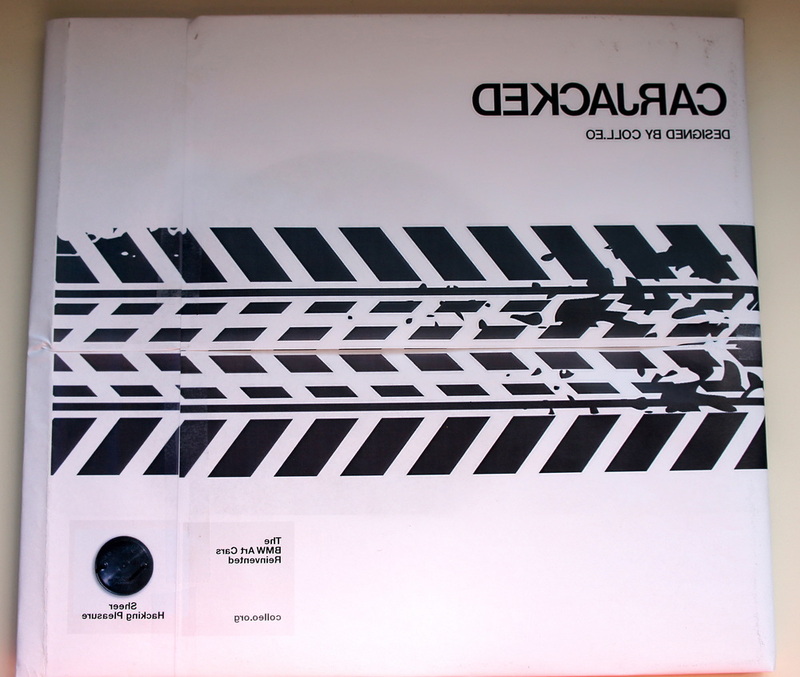 Ok, so the cover jacket features an automobile tire print. To answer that questions, one may consider Isabelle Arvers' definition of CARJACKED - the art project that inspired the book - as "an act of counter-appropriation". Specifically, COLL.EO appropriated both the BMW Art Car Initiative and a series of artworks - and/or trademarks, styles, and iconographic motifs of rockstar artists. It was therefore essential to communicate the counter-appropriative nature of CARJACKED directly on the cover. In other words, the book cover is a pseudo-ad campaign for CARJACKED - both the book and the artwork. Metonymically, the tire print on the cover stands for the hijacked vehicle. The back cover, meanwhile, shows the "reversed" the printed ad, as if it were reflected in a (car) mirror. The appropriation, however, does not stop here. We loved the indexical logic of Rauschenberg's artwork, a logic which informs CARJACKED as well, at least on one level as the series is, on another, eminently iconic. The variety of interpretation mirrors the heterogeneous nature of CARJACKED, a work that presents performative, photographic, painterly, and process elements. We loved Rauschenberg's scroll so much that, in order to emphasize the visual affinities between his piece and CARJACKED book cover, we initially mimicked the original design consisting of a black tire across a white background. Ultimately, however, we decided to reverse the color palette, choosing black for the background (an allusion to the road pavement) and white for the tire (a reference to paint). We came up with this iteration, which, after a few tweaks, became the 'final" cover. Last but not least, below is our very first cover experiment, which features the detourned BMW roundel designed by Jordan Braun for COLL.EO. In the final version, the roundel has been resized and relocated, but the original message has remained unchanged.